Wisdom Healing Qigong is a complete system of theory and practices that integrates ancient wisdom, modern science and the mind's creative power. It is a form of medical qigong. In several studies in China, this particular form was found to be the most effective. Using movement, sound and visualization, the practice opens us to the formless, invisible energy of the universe, from which all existence emerges. Physical disease and emotional problems are seen as bockages of energy in the body . When we access the infinite energy of the Source and awaken it inside, blockages dissolve, allowing the energy to flow freely. We relax. We feel our heart open, and a deep inner joy arises -- independent of the circumstances of our life. We experience a profound sense of harmony with all existence. We know ourselves as Love. Dr. Pang Ming is the founder of Zhineng (Wisdom Healing) Qigong. He studied qigong from childhood and he also trained as a Western doctor and a doctor of Chinese Medicine. He created this form of qigong from studying with 19 Grandmasters and using the most powerful practices from their lineages. Dr. Pang Ming democratized qigong -- which, until recently, had been only for the elite. He wanted everyone to have access to this profound and effective self-healing methodology. He put the secrets into the practices we learn from the start, which traditionally had been withheld from students until they had served their master for many years. Dr. Pang Ming insisted that he not be called Grandmaster. He preferred the prefix of "teacher" and he called his students "teacher" since we learn from each other. Dr. Pang Ming studied quantum physics and the nature of energy. Like all good scientists, he was interested in results. He established a research center, "the Medicineless Hospital" where people continually practiced qigong. The practitioners were tested by doctors on their arrival and on their departure after a month of intensive practice of Zhineng Qigong. The results were very encouraging. The condition of almost everyone (98%) of people improved. Many dramatically. 35% were cured -- no sign of the original disease. Since the qigong hospital attracted a large number of so-called hopeless cases, these were impressive results. Mingtong Gu trained with Dr. Pang, completing the last Master's Training in Zhineng Qigong before the Chinese government shut down the Medicineless Hospital. 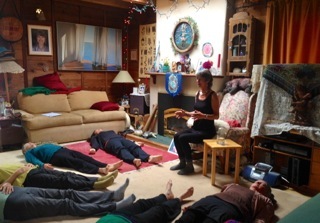 Many teachers set up smaller Zhineng Qigong retreat centers throughout China. 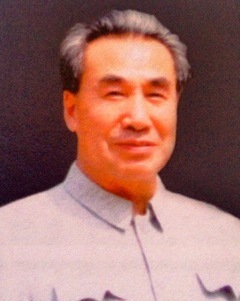 Master Mingtong Gu came to the United States and in 2005, he founded the Chi Center in the Bay Area. 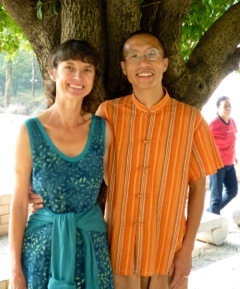 Recently, Mingtong bought his own retreat center in New Mexico where Vivienne often joins him to teach at Intensive Retreats.